It's windy on Uranus. The wind speeds sometimes reach 250 meters per second on Uranus. This would be equal to 900 km per hour winds or 560 miles per hour on Earth. It’s not visible to the naked eye, and became the first planet discovered with the use of a telescope. William Herschel wanted to name Uranus after King George III, as Georgian Sidus. Uranus was first seen by William Herschel in 1781 during a survey of the sky using a telescope. In 1782 George III appointed Herschel as Astronomer Royal. Herschel also discovered 2 of Uranus’ moons with a larger telescope. The mass of Uranus is about 14.5 times the mass of Earth and 63 Earths can fit inside Uranus. Uranus has a slow orbit. It takes 30,685 Earth days for it to orbit the sun completely. Uranus mass is 86,810,300,000,000,000 billion kg, which is equal to 14.536 times the Earth's mass. It takes Uranus 84 Earth years to orbit the Sun. Its axis is at 98 degrees, which means it almost lies sideways as it orbits the Sun. This means that the north and south poles of Uranus lie near where the equator is on Earth. During parts of its orbit one or other of the poles directly face the Sun which means the planet gets around 42 years of direct sunlight followed by 42 years of darkness. The 13 rings of Uranus were discovered in 1977 (first 9) at the Kuiper Airborne Observatory, in 1986 (2 more) by the Voyager 2, and in 2005 (another 2) by the Hubble Space Telescope. Many Asian languages translate Uranus into sky king star. Uranus is often referred to as an “ice giant” planet. Like the other gas giants, it has a hydrogen upper layer, which has helium mixed in. Below that is an icy “mantle, which surrounds a rock and ice core. The upper atmosphere is made of water, ammonia and the methane ice crystals that give the planet its pale blue color. Uranus is the first planet to be discovered by the use of a telescope. The north and south poles of Uranus are located where the equator lies on most other planets. This is because it tilts sideways on its axis rotation. In 1690, Uranus was recorded as a star, named 34 Tauri by John Flamsteed. Uranus hits the coldest temperatures of any planet. With minimum atmospheric temperature of -224°C (-371ºF) Uranus is nearly coldest planet in the solar system. While Neptune doesn’t get as cold as Uranus it is on average colder. The upper atmosphere of Uranus is covered by a methane haze which hides the storms that take place in the cloud decks. William Herschel, who discovered Uranus, originally believed it was a comet. The moons of Uranus are named after characters created by Alexander Pope and William Shakespeare. Uranus has the second most dramatic set of rings in the Solar System. Unlike Saturn’s particles which are made of bright ice, the rings of Uranus are very dark. They’re also narrow, only measuring a few km wide. Astronomers think that the rings of Uranus are very young, and probably formed relatively recently, and not with the planet. Although Uranus is more than 14 times the mass of Earth, it is the smallest of the giant planets. 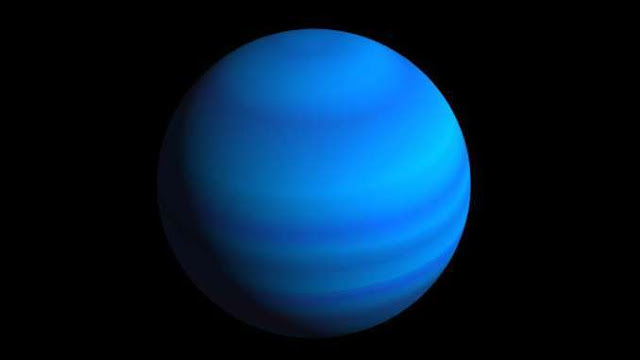 Uranus is named after the Greek mythological figure Ouranos, the God of the sky. Uranus has a total of 27 moons, most of whom are named after characters in Shakespeare’s Midsummer Night’s Dream. The five major moons are called Titania, Oberon, Miranda, Ariel and Umbriel. Umbriel is not from Shakespeare but is the “melancholy sprite” in a poem by Alexander Pope. Uranus has 13 rings, 9 of which are narrow rings, 2 of which are dusty rings, and 2 of which are outer rings. William Herschel was paid a yearly amount of 200 pounds by the Royal Family to move to Windsor and let the royals look through his telescopes. Uranus' equatorial circumference is 159,354 km. Uranus experiences seasons, while most other planets do not. Only one spacecraft has flown by Uranus. In 1986, the Voyager 2 spacecraft swept past the planet at a distance of 81,500 km. It returned the first close-up images of the planet, its moons, and rings. It might be hard to sleep all night on Uranus, if people could live there, as some parts of the planet experience night for over 40 years. There is a proposal to launch another mission to evaluate Uranus that would launch between 2020 and 2023, taking approximately 13 years to reach Uranus. The wind speeds on Uranus can reach 900 km/h (560 mph). The surface temperature on Uranus is -197 degrees Celsius, sometimes being as low as -224 degrees Celsius. It is the coldest planet in our solar system. The closest investigation of Uranus was done in 1986, by the Voyager 2. It had been launched in 1977. There have been 27 moons discovered around Uranus so far.